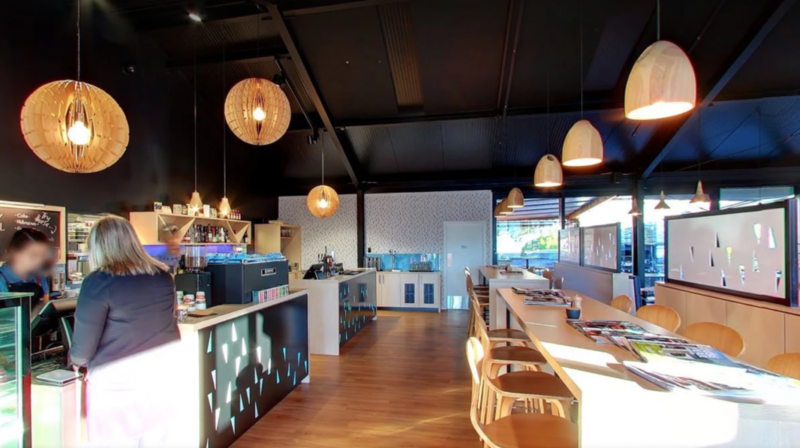 ten27 is a locally owned family run cafe, eatery and bar in the heart of Ferrymead in Christchurch. 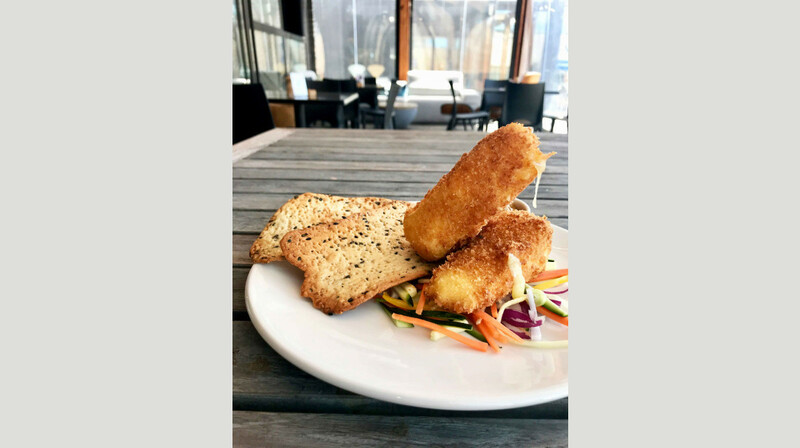 Bringing upmarket cafe fare, craft beer, New Zealand wines and live music performances to the area, ten27 is a refreshing departure from the big box strip malls of Ferry Road. It’s polished, sophisticated feel is complimented by the beautiful furniture and homeware store, Casual and Country, with which it shares both premises and ownership. 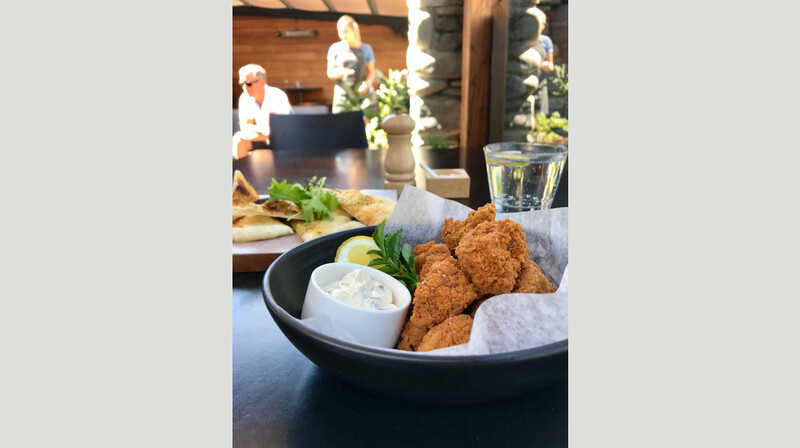 The airy, pristine interior is championed by the stunning exterior - architecturally designed by Greg Young in a post earthquake rebuild on the same site which has housed Casual and Country for 27 years and the cafe for 17. Owned by Jenny, John and their son, Ben, the Ferry Rd destination stocks Garage Project, Cassels & Sons and Three Boys craft beers and serves local produce. A charcoal bun beef burger and truffle polenta soldiers with avocado are menu heroes, along with the descriptively named John’s Mum’s Fudge which sits pride of place amongst other cabinet food and sweet treats. Seating for up to 100 people makes ten27 a great venue choice, and provides excellent peace of mind that there will be a spot available for your brunch, lunch or dinner requirements.Also housing two courtyards; one is dog friendly and the other may be the cosiest outdoor fireplace setup you ever encounter. Café Ten27 has an airy, pristine interior which is championed by the stunning exterior all adding to It’s polished, sophisticated feel. Myself, my wife and two of our very good friends had a very enjoyable evening together, listening to some live music while eating from their menu which seemed to be quite classic, but we were extremely surprised at the fullness or flavour that each meal delivered. The Crisp Skinned Salmon Fillet with green lipped mussels, was delightful and the Grilled Fillet Steak with trimming also was a meal that far exceeded original expectations. Thanks for a great evening Ten27. 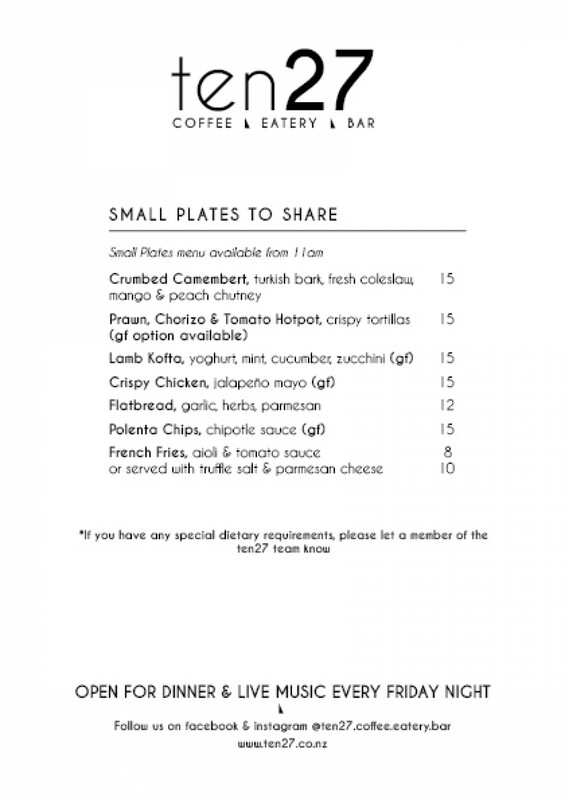 Ten27 is one of our favourite places to dine. They have fresh & tasty food and lovely atmosphere. We really enjoyed the live music . Thank you for a great night. I love everything about ten27. Whilst the food is always a knock out (we shared 3 of their generous sized starters and split 1 dessert between 2 of us) it is the exceptional service that really blows me away. Every time I've been in, whether for First Table dinner, morning coffee on the way to work, late brunch on a weekend, no matter who is behind the till, or serving the tables, everyone who works their is an absolute delight. So friendly, checks in on the meal, has a good chat, knows the locals, and welcomes newcomers all the same. As always, great food, amazing service. On top of great food and service the live music was excellent. 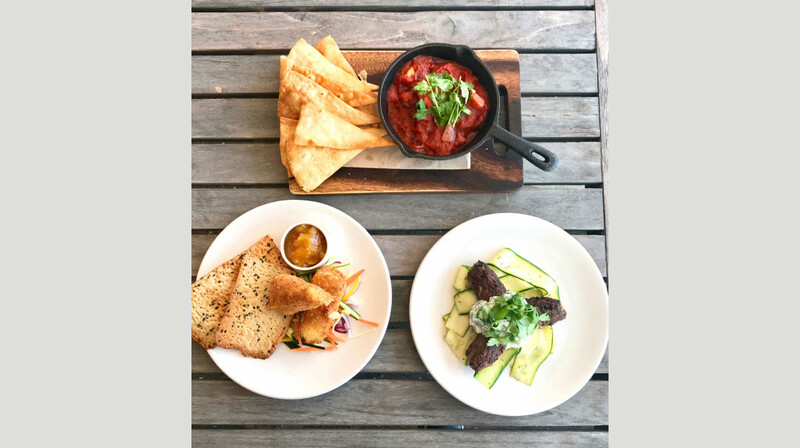 We really enjoyed our dinner at ten27 - the entertainment was great and the food was very delicious, I was impressed with how the food was presented. The service was great also. The live music was brilliant, staffs were friendly, food portion was very generous and delicious. We were so full after that! The whole dining experience was very relaxing, we thoroughly enjoyed our night. Thanks a lot. Great dining experience by our group of four plus a toddler, with delicious, perfectly cooked, well presented food. The staff are attentive, efficient and friendly - nothings a bother. The ambience is relaxed plus a bonus of being entertained by a live duo “Taylor + Song” who were superb. We really enjoyed their food. Friendly staff and nice live band show. We’ll be back for sure! Fabulous Friday night here, my partner and I decided to try almost all of the starter/share plates as they all sounded delicious, ended up with a lot of food - very generous portions and all super tasty we definitely didn't need to eat that much but the flavour was too good to say no to. Star of the meal was the lamb sliders - the flavour changes so will have to keep track of when lamb is back in rotation next to get some more. Awesome atmosphere, was really pumping at 6pm, live music, prompt service and people trickled out from 7pm onwards. Really great start to our anniversary night! Thank you! Great night out, we had a wonderful main of eye fillet, cooked perfectly with complementary sides and a delicious jus, a fantastic dish. A busy little restaurant with good service and a minimalistic but welcoming atmosphere, really enjoyed the live music and look forward to coming back to try out more of the menu. Great experience. Great atmosphere. Great music. Great food. Great meal with lovely music. We had a lovely date night out. Atmosphere was beautiful with it's lovely lighting and setting, with live music being played by Sarena, was really impressive and added to the beautiful surroundings. The food was perfect, we can't fault it, steak was cooked perfectly to our liking, flavours all complimented each other. Definitely recommend. I've been to Ten27 before, so already knew about the great food and atmosphere. Last night was no exception - a yummy meal finished with the most divine Apple Crumble - seriously, I can make apple crumble, but this was something that has to be experienced! The live Duo of John Lloyd and Harry Harrison playing rock, blues, country, and everywhere in between had us up dancing as soon as we finished our meal. What more can I say? Easy parking, happy, knowledgeable staff. We'll be back for sure! 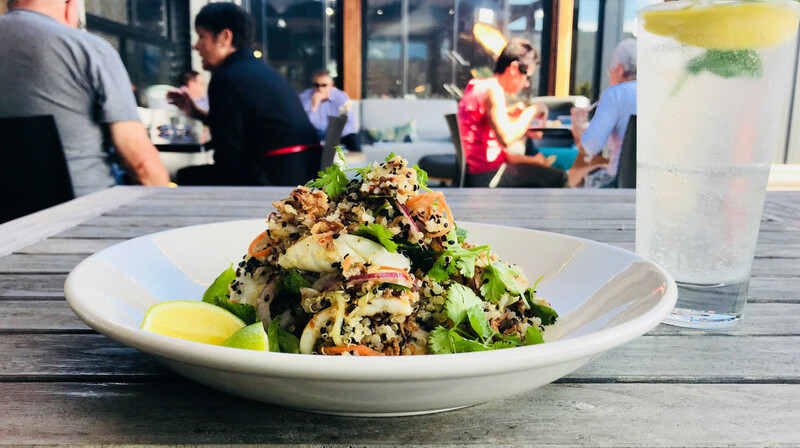 Wonderful food - the squid on quinoa salad absolutely delicious - and gluten free!! Service was excellent, friendly and professional. We had the added bonus of two for one bubbles to celebrate their 2 yr anniv, plus great music provided by their single entertainer who treated us to some old time favourites. Good company - fab night. We had a great night; the restaurant is child-friendly, we had excellent service, enjoyed the live entertainment and there was plenty to choose from on the menu - the kids loved the crispy chicken small platter (which isn't that small). We will definitely return. Whilst the menu might be slightly less expansive than other establishments, the food that they serve up is always tasty and well presented. The team also do a great job to make you feel welcome. 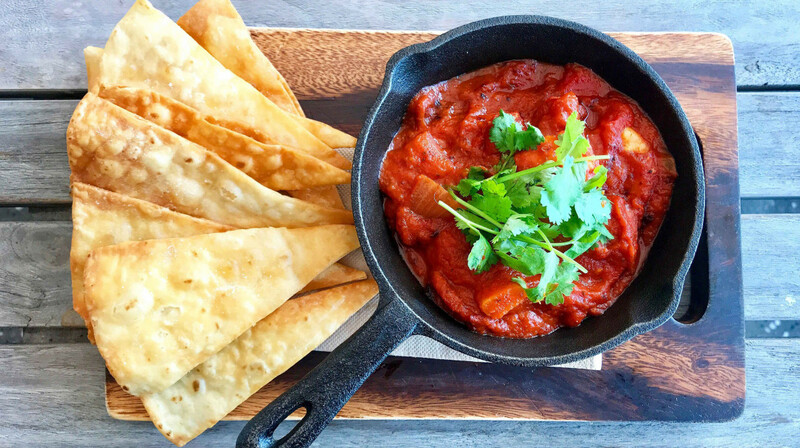 Coupled with happy hour and live music, it's a fantastic way to start the weekend! Loved the atmosphere and entertainment. Service was excellent. Except for the steak (which was meant to be a scotch fillet but wasn't), the rest of the food was excellent. Definitely a place to go. Great location, great restaurant setting, good food and great for the kids. The service was wonderful & everyone was bubbly & kind! Will be coming back for sure! Took my family out for a pre-Christmas dinner meal celebration and my dad was really impressed with the Canterbury Lamb Rump. We ordered the lamb and fish dish and both were very well presented and delicious. I choose the chocolate mouse for dessert,which was a very generous portion and was light and creamy. It came with fresh strawberries, white chocolate shards and brownie bits. Yum. Delicious food. Outstanding courses are the lamb koftas, fish of the day, lamb main and chocolate mousse. Great service, thanks. We had a fabulous dining experience at - Ten 27 it was our sixth wedding anniversary and the staff were absolutely wonderful I contacted them a few days before to organise a surprise for my husband they were so accommodating and helpful - he loved the surprise! All of the food was delicious the bread platter was huge and delicious and our mains were so tasty as well. My husband said it's the best steak he's had in a long time. We loved our visit we have no complaints at all and we will definitely be back and recommending to others! :) thanks! Lovely evening, great service, tasty food and Fab live music. 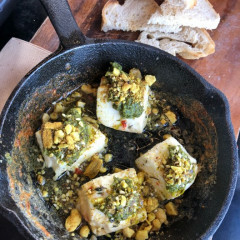 The thing I love most about first table, is it allows to to try out new restaurants and cafes that you may not have heard about or discovered normally. 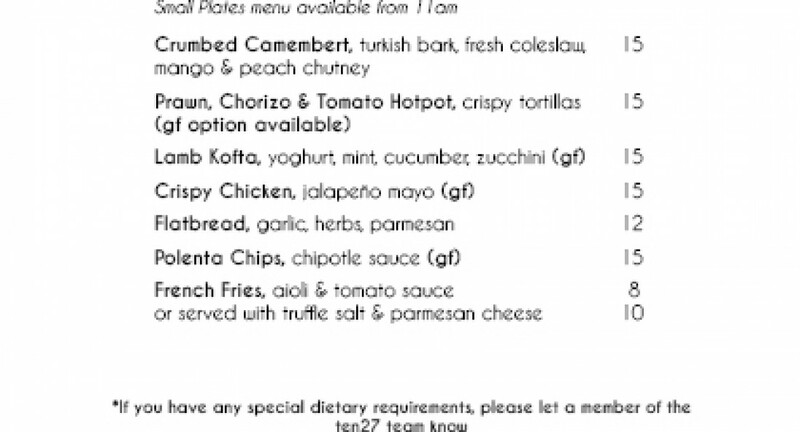 After seeing Ten27 on first table, I read some reviews and checked out their menu and decided I was pretty keen to give them a go. And thank goodness we did, because the food absolutely blew us away. My partner and I both think it is up there with one of the best meals we have had in Christchurch. We got the hallumi entree (drool worthy), salmon and lamb mains (the lamb was melt in your mouth amazing and probably the best I have ever eaten. Also the lamb with the date purée was...just yes!). We also the creme brûlée for dessert which was lovely. The restaurant also has a modern summery vibe and they have really payed attention to detail with the decor. The staff where very friendly and there was also acoustic music playing with really added to the ambiance. All in all the meal / dining experience was flawless. 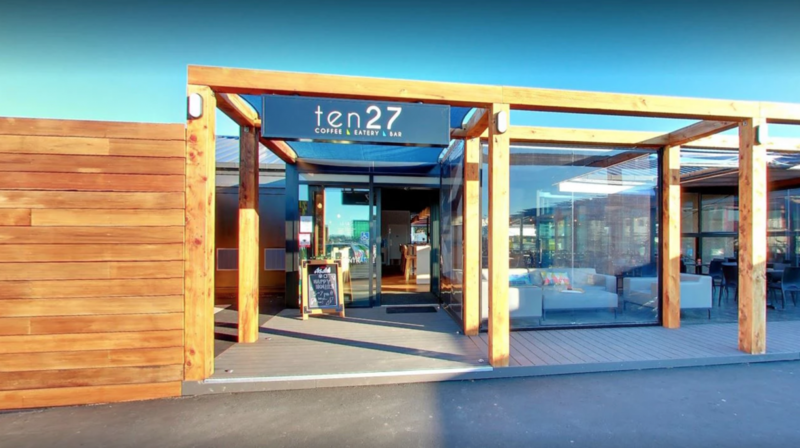 Ten27 is now one of our favourite Christchurch restaurants and we will certainly be going back. I honestly just need to experience that lamb dish again! Had a great dinning experience here! Staff were all very friendly, and the good was delicious and super quick!! Great evening great food. Entertainment was a bonus! Beautiful wee restaurant with lovely staff. Food first - we loved the chicken entree, it was tasty, crispy and plentiful. For mains we had the lamb - again plentiful, tender, with gorgeous fried polenta. The other main of duck fell a little flat. 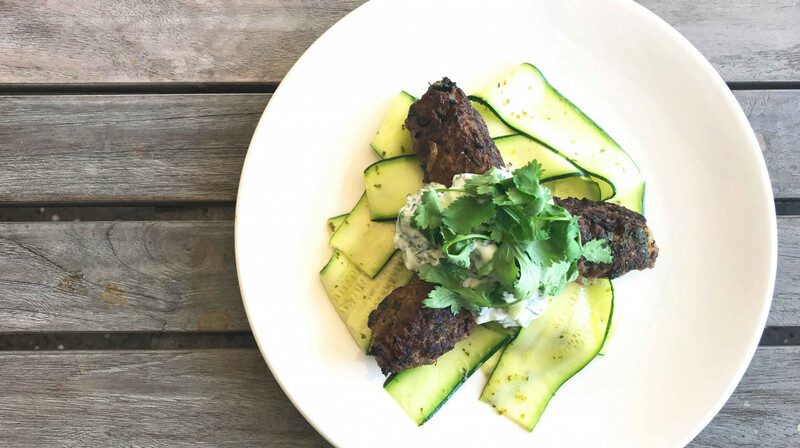 It was one of the most expensive items on the menu, yet it was a very small portion both in terms of protein and in accompanying veges. Taste was great though. Dessert brought the evening back up again with decadent mousse with brownie and chocolate (pretty 'slapped on' plating though). Girls night out for three of us. Two had the salmon and one had the duck. While the piece of salmon was a good size there were not many vegetables to compliment the meal therefore making the meals rather small. The duck also seemed rather a small meal. Next time I would probably order extra vegetables. However the presentation and taste of the meals was excellent.